Vancouver Whitecaps FC announced on Monday that the club has signed goalkeeper Sean Melvin to an MLS Homegrown contract for 2018, with options for 2019, 2020, and 2021. Melvin will join the club’s MLS roster upon receipt of his International Transfer Certificate (ITC). Melvin is the second Vancouver Island native to sign with Whitecaps FC in MLS, following in the footsteps of fellow Residency graduate goalkeeper Simon Thomas. He is also the second British Columbia native to be signed to an MLS Homegrown contract in the past four months, joining David Norman Jr. from Coquitlam. Melvin, 23, was most recently with Whitecaps FC USL affiliate Fresno FC as the Foxes began their inaugural season. In the past two years, the Victoria, BC native featured for Whitecaps FC 2 in USL, making 21 starts and appearances, and recording 80 saves, four clean sheets, and a 1.76 goals-against average. The 6-foot-4 goalkeeper was previously called up to the first team for the 2017 Canadian Championship, serving as the back-up goalkeeper for both legs of the semifinal series against Montreal Impact. Melvin originally joined the club in 2010, beginning with the ‘Caps U-18 Residency side. He also played in the USL Premier Development League, suiting up for the Whitecaps FC U-23 team in 2011 and 2013, as well as Calgary Foothills FC in 2015. In college, Melvin played three years for the University of North Carolina at Wilmington from 2013 through 2015, starting 43 of his 45 appearances for the Seahawks, and recording 122 saves, 11 clean sheets, and a 1.25 goals-against average. In international action, Melvin has made one appearance for Canada’s senior men’s national team, suiting up in their 4-2 friendly win over Bermuda in January 2017. During his youth, Melvin started his soccer career with his hometown Gordon Head Soccer Association, where he was named the club’s Most Outstanding Goalkeeper in 2006. He would later play with Victoria United Metro from 2007 to 2010. 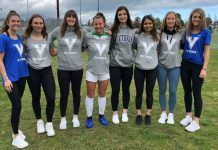 The young goalkeeper was also a member of the BC Soccer Provincial program from the U-13 to U-16 levels.